I know you will have done loads of organising already for your honeymoon in NZ, because that is what you do, but I have written you all my tips anyway! You’re going to have SO MUCH FUN. I don’t mean to gush but I LOVE NEW ZEALAND WITH ALL MY HEART BECAUSE IT’S WONDERFUL! Also this blog may be longer than my book… I’m putting it on my website so there’s going to be advice for solo travellers and what to do if you don’t have a car, hopefully you’ll find it helpful. Everything has a heading so you can skip to the bits you need. ATMs are plentiful, reliable and all charge a fee. Around $3. Pretty much everywhere takes credit card, but they don’t like giving cashback on foreign cards. The New Zealand dollar is currently 1.8 to the pound. But you'll probably be going after Brexit right? In which case you can exchange some of the goods you scavenged from the broken, deserted high street for NZD. The good news is the weather starts getting really nice in NZ in our winter, and, as this is is after the harvest, your feudal overlord will probably grant you leave to travel. I’ll go into each place in detail in their section, but, briefly, this worked really well and most places were excellent. Next time I’ll skip Westport (duuulllll), stay in chilled out Wanaka instead of hyper Queenstown and try and get to the Bay of Islands in the North Island. You can do New Zealand without a car or booking a hugely expensive hop on hop off backpackers bus like Kiwi Experience or Stray. Intercity buses go almost everywhere, and, if you buy the FlexiPass it works out WAY cheaper than booking individual journeys. In five weeks I used 60 hours on intercity which would have cost $459 ($7.65 an hour) if I’d bought them all at once. However, having a car does make things WAY easier. You can get to places without a tour, get to places where no tour goes, travel when it suits you and take way less time on the road because some of the buses take weird routes. If you want to rent a car you need to do it quite far in advance. Lots of people staying for a few months buy a car and then sell it at the end. There are Facebook groups where you can find people selling cars. Also a top tip from Bubbles (in Auckland) is to check out the car fair every Sunday morning at Ellerslie Racecourse. If you’re strapped for cash an air mattress in your car or in a tent is a cheap option - obviously as you’re honeymooning I' expect you’ll be 5 starring it, yis Liz? There is the campervan option which I’m afraid I know very little about. You need to book these really far in advance too, some hostels will let you park outside and use their facilities. BUT, for the non drivers, there are lots of travellers with spaces in their cars looking for company. I got my intercity pass, but jumped in a car whenever the opportunity arose. There's a Facebook group where you can post if you're after a lift. People also hitchhike a lot in NZ. I didn’t, but met lots of people who did and it worked well for them. A quick note about accommodation, I’ve already mentioned the campervan and car/mattress/tent options, and whilst my blog will be about hostels, Airbnb is also a really good option for couples. You’ll get a cheaper private room and get to meet some locals. The added fees for Airbnb make it pricey for a solo traveller so I didn’t do it. People also Couchsurf in NZ, and the Couchsurf app is a good way to find travel buddies. Be warned some men offering their sofas seem to want to use the app a little like Tinder… Another option for people with a lot of time is to do a Workaway, free room and board for a few hours work and getting to experience everyday life in New Zealand. If you haven’t used Booking.com yet you can get £15 off a booking using this link. I didn't do a massive amount of research. I passed a shelf of SIMs and all but one of the Vodafone cards were gone so I decided they were probably the best. It's worked out pretty well though. The SIM cost a couple of dollars and then I got 1.25gb, 200mins and unlimited texts for $19 for a month. These wonderful tourist information centres are in pretty much every town. They'll help you book stuff and give advice on tours and hikes. If you go in and say something like 'I only have an evening, what would you suggest?' They'll shower you with maps and brochures. Beautiful Auckland. Auckland is a lot like Sydney in a lot of ways. It has a nice harbour area, you can get the ferry to brilliant places, it's got a healthy cultural and culinary scene, and outside the city there's some stunning nature. I visited Auckland when I arrived and on my way out of New Zealand, but I’ve popped all my Auckland tips in this section. Accommodation: I stayed at Ponsonby Backpackers. I'd recommend it for solo travellers for sure brew. It attracts a mix of backpackers and has a lovely homely vibe. Also Ponsonby is the posh bit of Auckland so there's loads of great bars, restaurants and vegan refill stores close by. Walking into town took about 20 mins, there are buses but I didn't use them. Transport: the AT HOP card costs $10 and massively reduces the cost of journeys (a single without the card costs $3.50). After three or four journeys you'll have made your money back. Transport to the airport: There is a Skybus that goes from the Sky Tower in the middle of the city or a Super Shuttle that will pick you up from your accommodation for $25. I was pretty lucky to have a couple of friends in Auckland. My pal Cathal drove us about half an hour out of the city to the gorgeous Bethel's beach for a walk (looked a bit rough for swimming). And my friend Bubbles hooked me up with tickets to the Popup Globe, which is a very fun way to spend an evening in Auckland. Waiheke: A stunning island with vineyards and beaches. The ferry from Auckland Central (Pier 2) to Waiheke takes 40mins and is $40(NZD) return. You can buy your ferry ticket and hop on hop off bus pass together for $65, good if you want to see the whole island (buying the tickets separately adds $20). The local bus is great, it's also every 30 mins and a single is $3.50, less if you've got the AT HOP card. Loads of the vineyards are in walking distance of the ferry or a bus stop. Wine tastings are generally $10. A walk/bus DIY wine tour is a great, cheap way to see the Island. Rangitoto: Rangitoto is an island 25 minutes away from Auckland. It's beautiful. Go if you like hiking, volcanos and lava, especially if you like hiking up a volcano over lava. It also has some nice beaches and great views of Auckland across its mangroves. Return ticket from Pier 4 (Fullers 360) cost $36. We got the 9.15 ferry over and visited a beach as well as the summit, then got the last ferry (3.30pm) back. Day trip to the Coromandel: I booked a day trip from Auckland to the Coromandel penninsular with Kiwi Tours via bookme. It should have cost $250 but I got it for $150. Definitely check out bookme for some bargains! We visited the Hot water beach which was very crowded but very fun and Cathedral Cove, a truly stunning beach. The walk to the cove and back is a 30 minute hike each way, hills are involved, it’s a great place for a swim and a picnic. You can drive to the Coromandel for the day from Auckland or there is a ferry that takes you to Coromandel town, BUT that's not in the same place as the beach and the cove, so you'd need to look into transport in that end. Apparently it's a nice place to stay for a couple of days. I could have certainly spent more time on those beaches than the tour allowed. It's all about self catering in NZ so you don't bankrupt yourself, however Auckland is a great place to eat out. Especially if you end up staying in Ponsonby. Orphans Kitchen: Really lovely restaurant in Ponsonby (118 Ponsonby Road) with fresh , local food. A bit on the pricey side with mains for around $30 but the food (eg. Line caught fish, mint and yoghurt dressing) was beautiful. Deadshot: A speakeasy style cocktail bar where the cocktails cost $19 each and are made by the bartender based on what you like. Dangerously delicious. It's also on Ponsonby Road (number 45) and, in speakeasy fashion, doesn't have a sign. Fokker Brothers: This is a cheap and cheerful bar in the harbour area with a good happy hour and excellent burgers. A good place for a drink after getting off the ferry. The intercity bus is generally basic with no toilet and no usb chargers. But they do have WiFi (which may or may not work) and stop every couple of hours. Rotorua is incredible. The town has been built on geothermals and lots of businesses utilise them to provide heating. Whilst wandering through the park and along the lakefront you will casually pass steaming lakes and bubbling mud. FYI it also smells like rotten eggs. Accommodation: I stayed at the Funky Green Voyager which is a very good hostel. It's small, clean, has comfy beds, a nice common area and a well stocked kitchen. You can also park camper vans here and enjoy the hostel. I got eaten alive here, probably by mosquitoes so make sure you use repellent! The hostel is on the outskirts of the main shopping area, but opposite a huge supermarket. FGV attracts a mix of travellers, I made friends easily here. Food: I just self catered here. But they do have a row of restaurants near the Lakefront which looked nice. Redwoods at night: I did the Redwoods treetop walk at night which was beautiful. The enormous trees are lit with lanterns and other beautiful lights. It cost $29 NZD and took about an hour. I wouldn't recommend trying to walk there or back from the town in the dark. I made friends with someone who had a car, but there are also citylink buses that run out there. Tip: Go just before dusk for a free walk around the redwood forest and then pay for the treetop walk once it gets dark. Wai-O-Taupo: The geothermal wonderland! At this point having a car would have been helpful, but I booked myself on a tour to there with Headfirst for $75. If you’re not on a tour park admission is $35, Funky Green has discount vouchers too. The tour was great. We were taken to a huge geothermal lake and boiling mud pits before arriving for the daily eruption of the Lady Knox geyser at 10.15. The geyser was impressive but our tour group legged it before it had completely died so we didn't get stuck in the traffic of people moving from geyser to park. You need quite a few adjectives to describe the geothermal park. I will initially go for stunning, surreal and steamy (and stinky). Definitely walk all three of the loops, it only takes an hour and a bit to do the whole thing and the bit furthest out looks like there should be dinosaurs wandering past. 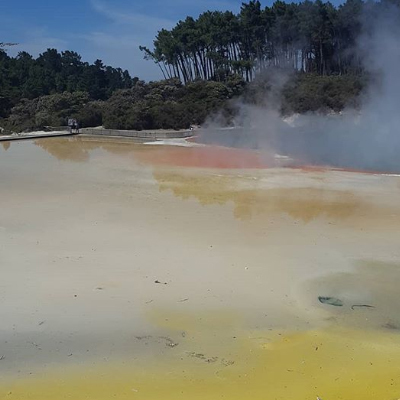 The ‘artists palette’ is the one you'll have seen on the internet or Instagram with yellow pools, green sections, the red shore, turquoise centre and so much steam blowing off it in all directions. There's loads to see there. It's great. Definitely go. Rotorua Kuirau Park: Rotorua's park is lovely civic hub of green spaces and more geothermals. It has its own geothermal lake, which is just gorgeous as the ones at Wai-O-Taupo, and little communal thermal foot baths. Also it's free. It's a great place to wander or read your book. Lakefront: Good for a stroll. I wandered down towards the water and found St Faiths Church, the military cemetery and the meeting house. The buildings look sort of alpine and the graveyard is fascinating. The whole area is on more geothermals. People have them in their gardens and someone had put a traffic cone over one #safetyfirst. I was also stalked by an extremely fluffy cat which is possibly the Lakefront welcoming committee. Say hi for me if you see him. Further along the shore there are seaplanes and a helicopter pad and another big green space. Polynesian Spa: We spent an evening in the Polynesian Spa. This may be a bit dull on your own, but with a few friends it was fun. The adult pools cost $30 and the hostel gave us 10% off vouchers. We went at dusk which was lovely as the sun was just setting. It was a bit crowded at 7.30 on a Saturday night. There were a couple of big tour groups. But it did calm down a bit after dark. Had 30 minute stop in Taupo, which is enough time to have a quick look at the lake. The Art Deco capital of the world. Accommodation: I stayed at the Criterion Art Deco Backpackers. It has a big, but slightly grimy kitchen and social area with a TV lounge. Again it is easy to chat to people here. HOWEVER the room I was in had bed bugs and the room I got moved to had a terrible bed. They argued it ‘wasn’t their fault’ when I asked for my money back. Stay at your own risk. Food: I self catered mostly but did have a halloumi wrap from the kebab place after the wine tour. I don't Australasia gets halloumi wraps, I haven't had a good one here yet. Here's where Napier redeems itself. 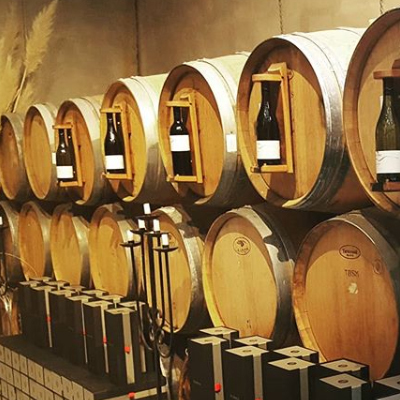 You can do a self guided Art Deco tour (buy a booklet from the i-site for $10) or, if you only have one day and you like wine you’re in one of the premier wine regions, you could do a wine tour?! Prinsys wine tour: I did a half day wine tour with Prinsys for $110. We visited four vineyards and got a cheese board. The tour was great. A highlight was trying to put a $50, $90 and $250 Syrah (Shiraz) wine in the right order. I got the expensive one right because I'm classy. I actually got a lift with my new pal Joe (from Dundee) and we stopped for a brilliant hike up Te Mata on the way. Highly recommend this walk. As a passenger I felt it was my duty to provide snacks and entertainment. I introduced Joe to 'No Such Thing as a Fish' the greatest podcast in the world, 'Evil Genius' and we tried 'Last Podcast on the left' their long podcast on flat earth was interesting, but they are shouty Americans which gets a little wearing after a while. Wellington is brilliant. Lots of people don't seem to like it but there's loads of nature, culture and food in New Zealand's capital. Accommodation: I stayed at my friends house, sorry. Everyone was talking about how lovely the Marion Hostel was though. Mount Victoria: is soooooo good and really steep for a something bang in the middle of town. The views are great. Go here. You can drive if you're feeling lazy. Botanic Garden: was lovely. Again super steep to get to the top, although you can take the cable car (common consensus is the cable car is a rubbish tourist attraction). It's a pretty standard Botanic Garden. Go if you've got spare time on a nice day. Zealandia: Really interesting project on the outskirts of Wellington, where they’ve tried to recreate New Zealand pre-humans. There’s only native plants, no mammals and SO MANY BIRDS. Its a really nice place to walk around and has some pretty energetic tracks. Well worth the $19.50 entry fee. Te Papa Museum: is outstanding. Probably the best museum I've been to. They have a beautiful exhibit on WW1 which hopefully will still be up post 2018. They also had an exhibit celebrating women's suffrage (which NZ did first), immigration and refugees. It's just great. And it's free. BATS: My friend Heather took me to see a great show she'd programmed at BATS. BATS is like Soho Theatre in London, it has multiple spaces, multiple show and champions new writing. Well worth a look when you visit. Other theatres: There's a few other theatres in the city including the Opera House which receives international touring shows (often from the West End!) Also make sure to check what's on in Wellington for music and festivals. There's always something on there. Cuba Street; A really quirky street with excellent food and bars. Also has a bucket fountain! Aunty Menas: AMAZING vegetarian curry place on Cuba Street. SO GOOD and SO CHEAP. Very casual, I’d highly recommend it for lunch whilst you’re sight seeing. Danger Danger: Is a funky little bar in town with very cheap drinks and a fun pub quiz at 6.30pm on Thursdays. Heather has a team that goes most weeks so maybe you guys will meet if you go for the quiz. Eva Beva: Is another nice bar with a good happy hour and excellent food. A favourite of Wellingtonians (Wellys?). You need to check in at least an hour before your ferry's departure time. Earlier if you're driving, although then you'll have booked direct and paid $180 or more and you'll be sent reminder texts. The ferry journey is beautiful. 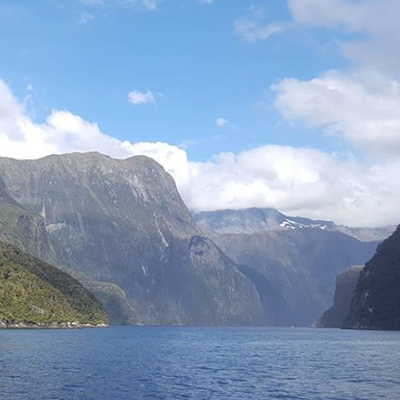 Sailing into the South Island was one of my trip highlights. I would recommend this over flying. I'm pretty sure there's nothing in Picton but I didn't stay long enough to confirm. Accommodation: I stayed at Alicante Backpackers. This pretty hostel used to be an old folks home. It's walking distance from the ferry and a supermarket. It's very clean and the beds are very comfy. You just need to deal with the owners. They will talk to you as if you're 18 and bang on the door of the shower to tell you to hurry up, not because you are taking a long time but because they don't have enough showers. Anyway it's good for a night. Activities: All I did in Picton was leave, but it's surrounding area, Queen Charlotte Sound, is really pretty. There's hikes and kayaking here if you have an extra day. A long six hours on intercity, but you do drive along the coast. You will think you see penguins. You will be wrong. They’re shags. *sniggers* They’ve just re-opened the scenic trainline that does this journey. Accommodation: I stayed at Foley Towers and loved it. It was a 20 minute walk from the bus station. The four bed dorm I booked turned out to be a room with three single beds in a lovely self contained house with a kitchen and lounge. If you book here request the house. Quake city: $20. Really excellent museum dedicated to the two earthquakes that flattened Christchurch. There's an hour and a half film of people telling their stories that plays on a loop, allow extra time to watch that, it's fascinating. Art Gallery: I did the free tour of the gallery, which goes at 11am and 2pm everyday. This was a great way to see the gallery and understand a bit more about the works. Canterbury Museum: also free. It's interactive and wonderful and has a great exhibition on exploring the Antarctic. Bacon Bros: Is hard to find as it's in a boutique food market called the Little High Eatery. Great burger though and very enjoyable burnt broccoli (is the most thirty-something thing I've ever said). Bit of a boring 4 hours on the bus. Oamaru is an extremely quirky seaside town with a penchant for anything Victorian. Workaway: I stayed in Oamaru for five days doing a Workaway at a farm. This was great and I can give you Helen's details if you fancy a stay on a farm. Artists Quarter: Quirky as f*ck. Especially the Grainstore Gallery which has SO MANY PICTURES OF EYES. It's free to have look round, definitely check it out if you're in town. Steampunk museum: $10 entry and a fun way to spend an hour. There's lots of sci-fi steampunk sculptures, most of which you can sit on/ climb on/ play with. The penguins: There's a colony of little blue penguins at Oamaru. After the sun sets you can see them returning from their day of fishing. You can either pay $20 to be in the colony itself or go to a pier next door for free. You'll only see a few in the free area which is what I did. I reckon it might be worth paying to see a few more. Quick two hours on intercity. Also known as the Edinburgh of the South. Accommodation: I stayed at Kiwi’s Nest which was lovely. A bit of a walk from town, very calm and clean. Very very calm. Attracts a lot of people on conferences. If you stay here book your intercity bus to and from the Dunedin university stop if possible. It'll save you a long walk. Dunedin is a great place to go to the cinema or see live music. It's a student town so there's loads on. The central quarter is very pretty and there was a Christmas concert in there when I arrived. Otago Peninsular: I really felt not having a car down here. If you have a car you can drive to the Peninsular, get on a wildlife cruise or check out the Albatross sanctuary. I ended up booking a harbour cruise/ wildlife cruise for around $150. The harbour was shrouded in mist and the wildlife cruise made me sick... Did see an Albatross though. Didn't feel worth it to me but I guess it depends how much you like albatrosses. Six hours on intercity but so beautiful I would happily do it again. Oh Queenstown with your lake, your adventure activities and your 1.8 billion other tourists. You are gorgeous though. Accommodation: I stayed at Adventure Queenstown, apparently the best hostel in NZ. It was very good. Lovely kitchen, central location, activities every night. Lots of younger travellers, but that's probably true of most places in QT. Books up fast. A little note on prices, I did these activities in November. I think the price goes up as NZ gets into their Summer. Milford Sound: I did the Jucy gem tour to Milford Sound. Normally $160 I got it for $150 on bookme. You can do cheaper day trips that start earlier. I reckon this one was worth the extra $30. It picked us up at 9am, provided lunch and a glass top coach and a 'premium cruise' which isn't really necessary as you spend most of your time outside. It's a four hour bus to Milford, two hour cruise and four hour trip back. But with walking and photo stops on the way there and a showing of 'Hunt for the Wilderpeople' on the way back, the bus was pretty fun. White water rafting: I booked the shot over river rafting (grades 3-5) for my first ever rafting experience and it was EPIC! So fun. The company is called Go orange. I paid $159, maybe you can get it cheaper on bookme or if you book a few things at once with a travel agent. Track to Frankton: Flat, pretty track that takes you to Frankton in an hour, where there's a nice cafe on the water (the boatshed) Then you walk back. A gentle, pretty activity. Other activities: If you want to jump off something or out of something QT has got you covered. There's also loads of other hikes. Ice bar: Had a voucher so only $13 for entry and a cocktail. If I'd paid more I'd have been annoyed. An 8 hour bus journey! Was stunning though and had walking and photo stops so was actually fine. One of my favourite places. I spent two full days here and had a lovely time. Accommodation: I stayed at Glow Worm hostel. The rooms are average but I'd still highly recommend staying here. They give away free soup at 6pm every night which gets everyone chatting. Also free breakfast, free popcorn, nice staff. A real mix of people stay there including families. Glow worms! After dark you can do the short Terrace Walk from town and see glow worms for free. Robert Point track: Probably my favourite hike in NZ. There's lots of semi-climbing in this 5 hour return trip to a glacier viewpoint. You can do it alone because there's loads of other people about. You absolutely cannot do it in the rain, it's slippy and kind of dangerous when it's dry. The view of the glacier is great, clouds allowing. Valley Walk: Super easy hour and a half walk to a low glacier viewpoint. Lots of lovely waterfalls. Alex Knobb and other tracks: I didn't do the 8 return hour hike up a nearby mountain to see the glacier from above. If the clouds are low you can't see anything from the top. There are a few other short hikes around the town and the glacier too. Helihikes: Pricey. As I don't technically have any travel money left I didn't do one of these. They look incredible though, you go to the top of the glacier and get to go inside it too. They are weather dependent though, lots of people had theirs cancelled or rescheduled. Wildlife centre: $25 tickets if you stay at Glow Worm (and other places too probably). You're mostly paying to see kiwis in a nocturnal area. Worth it! THEY'RE SO FLUFFY! At first glance Westport is a ghost town, but when you spend some time there and really get to know the place what you'll discover is that truly, deeply and at its core, Westport is a ghost town. TBF I only spent about 24 hours there. That was plenty. Accommodation: Bazil's surf hostel. I arrived to sign that said 'I'm out surfing. You should be too.' This is an unhelpful sign. I have tried my hand at surfing and know it would be tricky to surf wearing a giant backpack and with your kitchen supplies hanging off your shoulder. Things got better though. The staff, when they turned up, were very nice and the hostel was pretty dead so I got a room to myself. The Kiwi bus stops here so the few people who were staying there were a tight knit group. For me, Bazil's wasn't great for meeting folk. Surfing: I did not go surfing but you can? The hostel offered lessons for $50 or you got one free if you stayed for five days. Do not stay in Westport for five days. The Millennium track: Cross the deserted high street and step over some rusted metal that used to be train tracks and you will find the Millennium track. It's a nice track along the river and through some Bush. Got a bit dull after a while but was a good post bus leg stretch. Kawatiri River Trail: It's probably lovely. It's another track you can do from town that takes you to north beach. But by the time I'd walked through silent Westport and past the smelly fish factory it had started to rain so I did a short version. If the sun is shining doing this track and having a picnic on the beach would be fun. A four hour bus journey that felt like three, with a stop at the Pancake Rocks. If you can bear it maybe do Franz Josef to Westport in one go and save yourself a day. If you're driving that's totally doable. At first glance Nelson is a ghost town... but before I could convince myself the town's at the top of the West coast were, in fact, an elaborate hoax, I passed some pubs and restaurants with people in them and it turns out Nelson is pretty lovely, especially when the sun comes out. Accommodation: I stayed at the beautiful INNbetween Lodge and Backpackers. Really lovely design and very comfy beds. Also an excellent free breakfast is available for those up early enough to get some. I'd definitely recommend this hostel. Eat in the kitchen if you want to make friends here. ABEL TASMAN! There are so many options for exploring the stunning turquoise coast line of the Abel Tasman national park. You can walk or kayak for a day or three, camp or stay in a hut (you need to book ahead for this) and get water taxis to start or complete. I booked The Seals and Sand tour with Abel Tasman Aqua Taxi. Their bus to and from Nelson cost a reasonable $30 and the 'tour' cost $79, a combined price of $109. This is cheaper than the kayak day tours, but more expensive than just getting dropped by the boat and walking back. The water taxi takes you for a little look at some seals before dropping you at Torrent Bay. I then did the four hour hike to Onetahuti, stopping for lunch at Bark Bay. There's quite a long uphill stretch after Bark Bay. At one point I did tell the hill to f*ck off, but it didn't. I chilled on the beautiful beach until my water taxi back, we saw some dolphins on the way back! That was great! Get the boat to Totaranui walk to Onehatuti and camp there or stay in a hut. The next day kayak to Anchorage (missing the hilliest section), arrange with the kayak company to transfer your bags to the camp site, the following day walk to the end of the track. Most companies offer bag transfers, Abel Tasman Aqua Taxis certainly do if you've booked a boat ride with them. Arguably you could transfer your bags (and maybe a cooler of food and beers) to each site and just carry days packs. Indian Cafe: Colourful restaurant and great curry! Highly recommend this place for a meal out or a takeaway. #PSA curries in NZ tend to come with rice. I made the mistake of ordering extra in Christchurch. Craft beer: I also had some excellent beer here. FYI Nelson is the self proclaimed capital of craft beer! They have a trail you can do. A trip you can do on public transport in a day. The coach from Nelson to Picton takes 2 hours and then the ferry takes three and a half. They have a free shuttle from Wellington’s port to the city. I really like Wellington, as the boat approached there was an actual rainbow over the city, which felt appropriate. All my Wellington tips are in the Wellington section above. I got the Northern Explorer Scenic train up to National Park. It took five hours, cost $79 and was very pleasant. The train was only half full so you're probably okay to book it when you get to NZ. It’s more expensive to book tickets from abroad! Get a friend in NZ to book for you or try and do the VPN thing. Also it doesn't go every day so factor that in. My first impression of the National Park Village was 'a bit bleak'. There is a train station, perhaps four streets and a tiny supermarket attached to a petrol station. But people come to National Park for one reason and one reason only, the Tongeriro Crossing and for that reason a stay there is 100% worth it. Accommodation: I stayed at the Howard Mountain lodge in a three bed dorm. My bed was terrible but everything else was nice. If you get the bed with broken springs ask to move, otherwise it's as good a place as any to stay. Popularly known as the most scenic day hike in New Zealand and for good reason. The walk is stunning. You pass Mount Doom, then you climb a mountain and then walk between peaks over-looking gorgeous blue lakes. It is not easy. The uphill goes on for quite a while and there are so many people that if you pause to take a breather you can end up waiting for a break in the traffic to get going again. It is not easy, but it is definitely worth it. Our hostel booked the shuttle for us which gave a pick up time based on the weather forecast and they were spot on - they dropped us off at 6am and expected most people to make the 2pm bus back and at 2.10pm it started raining. You need decent shoes to do the crossing and they won’t let you do it in jeans. I would advice hiring hiking poles as they'll make a big difference. Me: So where's the schnapps? Barman: All the 'lodge name's were taken. So we just picked that. Nice pub with good food (around $18 a main) and average priced beer. You can get a 6 hour intercity bus, but I ended up getting a lift with some lovely girls I met at the aforementioned Schnapps Bar. We stopped at Hamilton’s Lake to stretch our legs on the way. I’ve put all my Auckland tips in the Auckland section so here ends my epic saga of a five week adventure in New Zealand! Congratulations if you made it to the end! Have a magnificent honeymoon Liz! Let me know if you have any other questions. Also have you tried booking.com? I use them pretty much exclusively now as my ‘genius’ discount makes them cheaper than everyone else. Here is a link that gets you £15 off the first time you use them* Try booking.com. The best day job for writers?